Whisk together the broth, water, tomato paste, thyme and salt in a 5- or 6-quart slow cooker until smooth and well combined. 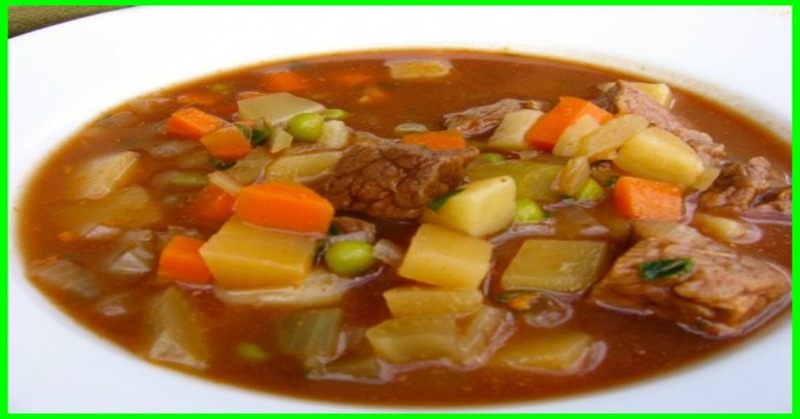 Stir in the cubes of beef, carrots, celery, onion, potato and turnips. Cover and cook until the beef and vegetables are fork tender, 4-6 hours on high or 8-12 hours on low. At the end of cooking stir in the peas. Cover and cook until the peas are heated through, about 10 minutes. Nutritional estimates per serving (2 cups): 213 calories, 3 g fat, 25 g carb, 5 g fiber, 22 g protein and 5 Weight Watchers PointsPlus. The cookbook says that this soup freezes beautifully, but I'm not usually a fan of potatoes that have been frozen. Give it a try and let me know what you think. Vary the vegetables to suit your tastes. This would also work well with a package of frozen mixed vegetables and be even easier. Don’t forget to Like our Facebook Page and Follow our Pinterest Board.